What Will Boston Bomber Dzhokhar Tsarnaev's Team Say At His Sentencing Hearing? Next week, the sentencing phase of the trial of Boston Marathon bomber Dzhokhar Tsarnaev will begin, with the same jury that convicted him on 30 counts weighing a possible death sentence against him. The whole process could take a month on its own, according to the Boston Globe , and there's a good reason for that — the stakes can't get much higher than deciding on a convict's life or death. There'll be a whole new round of testimony, to boot. 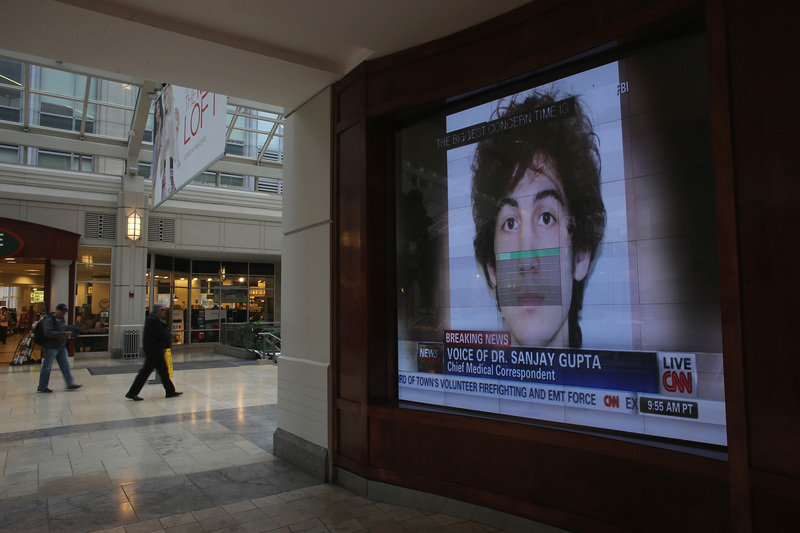 So, what will the Tsarnaev sentencing testimony look like? It's impossible at this juncture to say exactly who will be testifying to exactly what, because that information isn't a matter of public record right now. That doesn't mean we can't get a pretty good idea of what to expect, however, based on the prior arguments of both the Tsarnaev prosecution and his defense team. All throughout the trial, the respective camps have been jockeying for position on a very specific point: whether Dzhokhar, the younger of the two Tsarnaev brothers, was radicalized into the bombing plot through extremist rhetoric online, or whether he was under the sway of his older brother Tamerlan. While this distinction might seem small in casual discourse, it could be huge within the courtroom — their goal is to demonstrate that Dzhokhar should get some measure of leniency, because he was under the influence of a domineering authority figure. All this considered, the sort of testimony the courtroom's likely to see does become a little clearer. On the defense side, it seems likely there'd be some manner of testimony from mental health experts, aimed at bolstering the argument that he was less an independent predator than someone under his brother's thumb. According to criminal defense attorney David Hoose, who spoke expansively to WBUR after Tsarnaev was convicted, it's also possible that the merits of the death penalty and the risk of martyrdom could come into play as well. This is what the case has been about right from day one. No one has ever suggested that he didn’t do this. It’s always been about what is the appropriate response. Is it a sentence of death? Is death the only way to deal with this? Or is a sentence of life in prison without any possibility of him ever getting out, is that a sufficient and appropriate penalty? I think you’re gonna hear a lot of evidence as to why Mr. Tsarnaev should not be sentenced to death focusing on his age, the influences of his brother, the ability of our prison system to handle people like Mr. Tsarnaev and the question of whether or not we are not creating a recruiting tool for a-Qaida, ISIS or whoever by executing and making people like Mr. Tsarnaev in effect a martyr. The prosecution, on the other hand, probably has the simpler emotional task — they've got to convince the jury that Tsarnaev's crime was so heinous that it merits his being put to death, and there are a number of ways to do that. Like connecting the dots between the bombing and his ingestion of radical Islamist content, like Al Qaeda's Inspire magazine, and recordings on his laptop of slain jihadist cleric (and U.S. citizen) Anwar al-Awlaki, who was killed by a controversial U.S. drone strike in 2011. While this is admittedly speculative, you'd think they'd want to get an expert on terrorist indoctrination on the stand at some point. In short, the trial and the testimony is likely to continue moving fairly familiar lines, with one side building the image of a passionate, self-motivated, terroristic killer, and the other a young man who made a heinous decision under pressure from his brother, someone who deserves the chance to live and to change. Whichever version the jury goes with be the final word — exempting the inevitable, years-long appeals process that a death sentence would bring, naturally.